Playing Thursday’s opponent Concordia-St. Paul gave the Gophers a chance to put on display why both the media and coaches polls have them ranked 15th in the country. Even with the significant loss of key reserve Eric Curry to a season-ending knee injury the power forward position is in great hands with 6-foot-6, 240-pound junior Jordan Murphy, who when playing with a high motor is one of the toughest players to match up with in the Big Ten. Murphy was as aggressive and efficient as you could be on both ends of the floor with 22 points on 9-for-10 shooting, to go with 11 rebounds, two steals and two blocks in 21 minutes. Sure, it was against a Division II opponent, but he was engaged every moment he was on the court. Most importantly, it was how Murphy started both halves that set the tone. Gophers coach Richard Pitino talked at Big Ten media day in New York about how the Gophers would look to their All-Big Ten forward as a go-to offensive threat this season. That was clear on the first play of the game when Amir Coffey threw the ball to Murphy just outside the paint in the first 30 seconds. Murphy then went to work driving hard to the middle and scoring on a running hook shot. A minute later, Murphy used his 7-foot wingspan and quick springs to reject a layup attempt by Golden Bears center Cody Carlson. After Concordia went on a 13-2 run, the Gophers responded with a 16-4 surge of their own with Murphy scoring eight points. The San Antonio native had 18 points, eight rebounds and two blocks in 17 minutes in the first half. To open the second half, Murphy took to the defensive end and picked up two steals in the first minute to lead the Gophers on another rally. This new and improved Murphy also led the Gophers in the Oct. 22 secret scrimmage win against Creighton when he finished with 24 points and eight rebounds. There were glimpses of him becoming a go-to performer to end the 2016-17 season. He averaged 14.3 points and 11.5 rebounds in the last 11 games to earn All-Big Ten third team honors. Murphy was the top scorer among Gophers in the Twin Cities Pro-Am this summer, averaging more than 20 points per game. As a sophomore, Murphy averaged 11.3 points on 50 percent shooting from the field. It was almost identical to his scoring as a freshman (11.6 ppg). But those numbers should finally rise in his third season. -- The Gophers were one of the worst three-point shooting teams in the Big Ten last season, ranking 11th in the conference at 34.2 percent. But they went 10-for-26 from beyond the arc Thursday, including 7-for-17 in the second half. We’ll see if this type of shooting can continue against better competition and when the games actually count. But being able to stretch the defense from long distance could go a long way with strong post play from Murphy and Reggie Lynch. Seven different players made threes against Concordia, including two each from Nate Mason (2-for-5), Coffey (2-for-3) and Jamir Harris (2-for-6). Don’t be surprised if those three are the team’s top shooters this year, along with Dupree McBrayer. 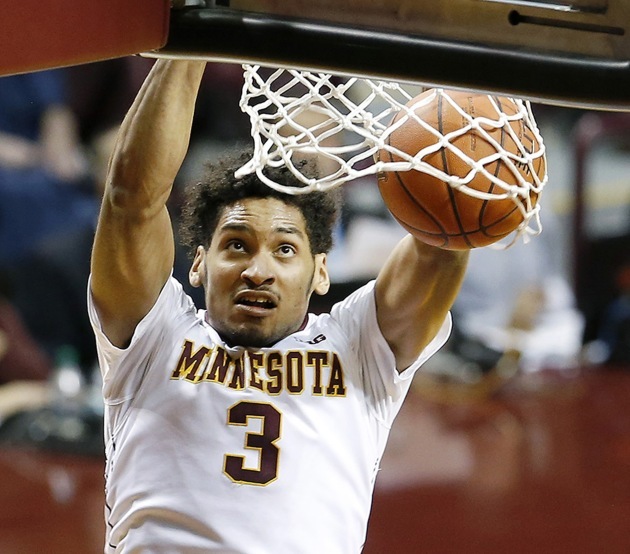 -- Having more depth at guard this season should mean the Gophers can play at a faster pace. Mason, McBrayer, Coffey, Harris and Isaiah Washington all won’t hesitate to push the pace. Posts like Murphy, Lynch and Davonte Fitzgerald are capable of getting out and running as well. The Gophers scored 28 points off 17 turnovers. Their 26 fastbreak points were also impressive Thursday. Many of their seven dunks were in transition.